I am sick and tired of reading afrocentrist propoganda that is entirley based on assumption. The Ancient egyptians prior to the 7th century BC were caucasian. "To assess the extent to which the Nile River Valley has been a corridor for human migrations between Egypt and sub-Saharan Africa, we analyzed mtDNA variation in 224 individuals from various locations along the river. Sequences of the first hypervariable segment (HV1) of the mtDNA control region and a polymorphic HpaI site at position 3592 allowed us to designate each mtDNA as being of 'northern' or 'southern' affiliation. Proportions of northern and southern mtDNA differed significantly between Egypt, Nubia, and the southern Sudan. "...we can infer that the migration of northern mtDNA types to the south is older than the migration of southern mtDNA types to the north (or that there has been less gene flow from north to south than from south to north along the Nile River Valley) and that Egypt and Nubia have had more genetic contact than either has had with the southern Sudan. Moreover, we can tentatively infer that these migrations occurred recently enough to fall within the period of the documented historical record of human populations in the Nile River Valley." "...the present study on the Y-chromosome haplotype shows that there are northern and southern Y-haplotypes in Egypt. The main Y-haplotype V is a northern haplotype, with a significantly different frequency in the north compared to the south of the country: frequencies of haplotype V are 51.9% in the Delta (location A), 24.2% in Upper Egypt (location B), and 17.4% in Lower Nubia (location C). On the other hand, haplotype IV is a typical southern haplotype, being almost absent in A (1.2%), and preponderant in B (27.3%) and C (39.1%). Haplotype XI also shows a preponderance in the south (in C, 30.4%; B, 28.8%) compared to the north (11.7% in A) of the country. "It is interesting to relate this peculiar north/south differentiation, a pattern of genetic variation deriving from the two uniparentally inherited genetic systems (mtDNA and Y chromosome), to specific historic events. Since the beginning of Egyptian history (3200-3100 B.C. ), the legendary king Menes united Upper and Lower Egypt. Migration from north to south may coincide with the Pharaonic colonization of Nubia, which occurred initially during the Middle Kingdom (12th Dynasty, 1991-1785 B.C. ), and more permanently during the New Kingdom, from the reign of Thotmosis III (1490-1437 B.C.). The main migration from south to north may coincide with the 25th Dynasty (730-655 B.C. ), when kings from Napata (in Nubia) conquered Egypt." "The Hpal (np3,592) mitochondrial DNA marker is a selectively neutral mutation that is very common in sub-Saharan Africa.... From 29 [Merotic Nubian] individuals analysed, only 15 yield positive amplifications, four of them (26.7%) displaying the sub-Saharan African marker. Hpa 1 (np3,592) marker is present in the sub-Saharan populations at a frequency of 68.7 on average. Thus, the frequency of genes from this area in the Merotic Nubian population can be estimated at around 39% (with a confidence interval from 22% to 55%). The frequency obtained fits in a south-north decreasing gradient of Hpa I (np3,592) along the African continent. Results suggest that morphological changes observed historically in the Nubian populations are more likely to be due to the existence of south-north gene flow through the Nile Valley than to in-situ evolution." Ancient egyptian mummy. Hair and facial characteristics clearly caucasian. Hor. Notice the caucasian nose and lips with blusih grey eyes. A common feature among negros is 'prognathism' which is not displayed in any of these mummies. It is rarely seen in caucasians. 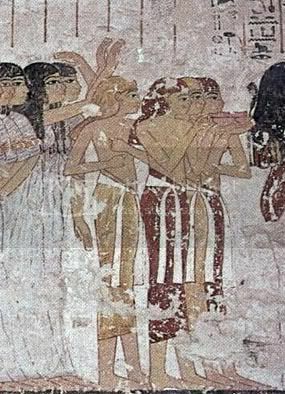 It is also not displayed in paintings which depict Egyptians. Though they were aware of it when they painted nubians. The egyptians became 'negros' around the 6th and 7th century. This is where most of the afrocentrist 'evidence' comes from. Last edited by The Informer; 28th January 2010 at 10:12 PM.